Stihl makes chainsaws. The recently ran this ad campaign trumpeting the fact that they do not sell their products at Home Depot or Lowe’s (giant DIY stores for those of you outside the US). 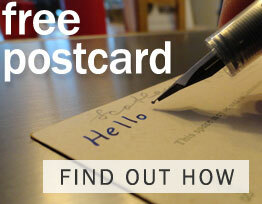 They sell exclusively through independent dealers and want to keep it that way. When the iPod was introduced, it was only sold at Apple Stores or online through Apple’s Store. Maybe a year later, they opened it up to just about any retailer. Good choice. Stihl? Pay attention. My first thought, before I read your text, was that they were complaining that those people didn’t sell it, but they would like them to. However, probably because of US TV I’ve heard of Home Depot. Thanks Paul – I updated the post to hopefully make it a little clearer. I didn’t realize that potential Stihl-buyers were snobs. Home Depot sells primarily Poulan. They probably bought the brand; that’s how they operate. They bought Ridgid and Ryobi. 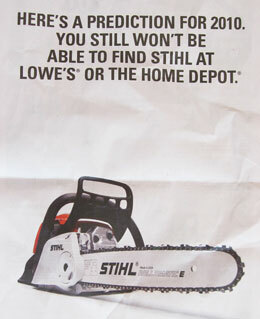 So Stihl may not be sold there because of that. I don’t know about Lowe’s. Both chains operate like Walmart; volume is everything.